One of the oddest ingredients to put in a dessert, in my opinion, is beans. But in China, red beans were used all the time in sweet food. I learned to appreciate the dense little red bean cakes that were common for Chinese New Year, but I did draw the line at eating red bean ice cream. The sweet paste sandwiched inside something vaguely resembling a pastry wasn't so bad, but the whole beans in sweets sort of turned me off. My family ate a lot of beans growing up - as they were inexpensive- and a casserole with rice, beans and cheese showed up on our dinner table pretty often. 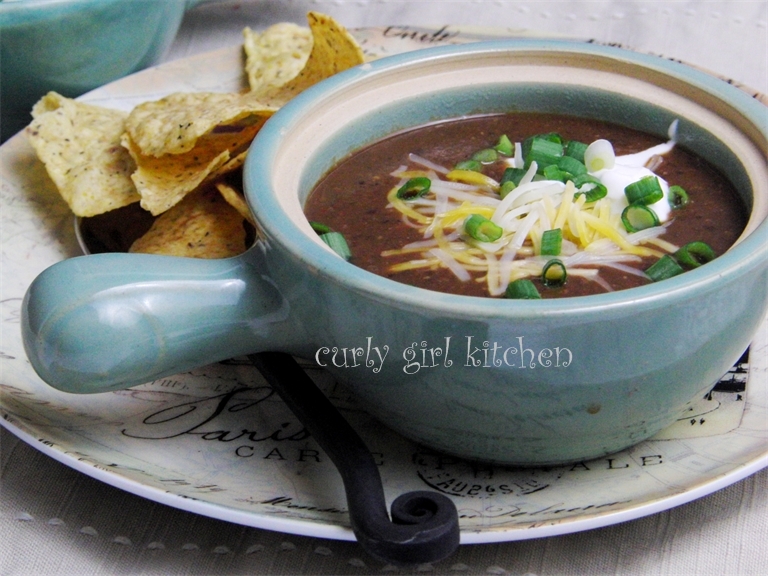 But it wasn't until the past few years that I started eating more black beans, and realized what a yummy, creamy texture they have. During our weekend in Grand Lake, we ordered for dinner their special of the evening, a multi-course dinner for two. After the shrimp cocktail, they brought out the soup of the day, and it was a rich, creamy and smooth black bean soup. Easily the best I'd ever tasted. I was inspired. 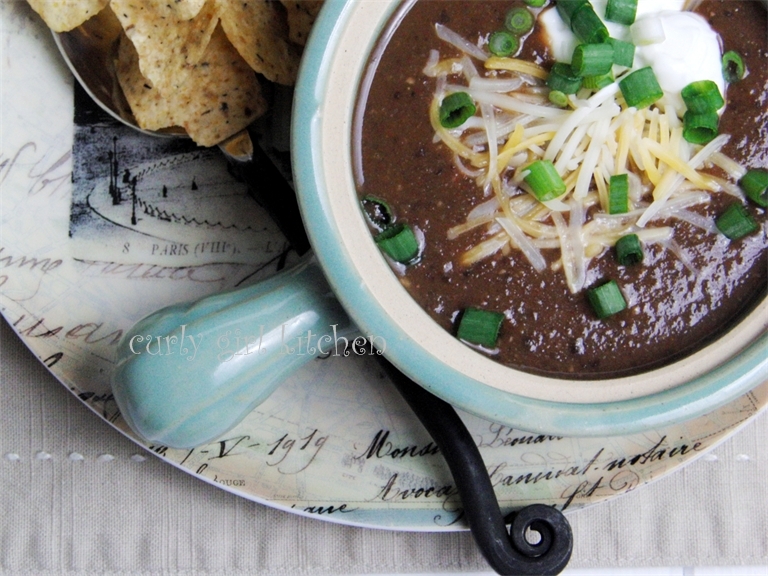 I knew I had to make black bean soup as soon as possible after we got home, so I put it on the menu for the week. 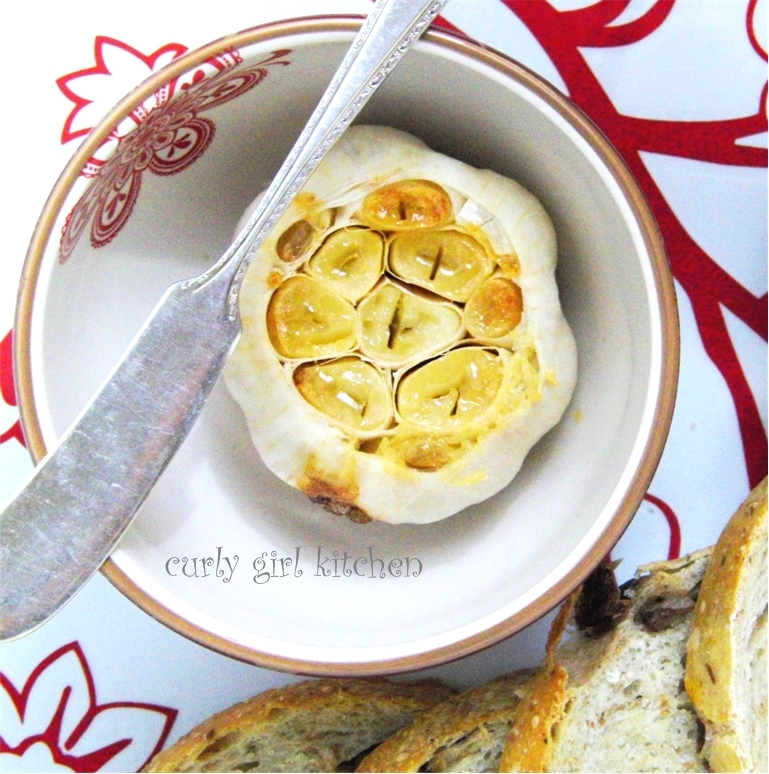 I've also been wanting to make roasted garlic again - it's been a while since I've done that, and the roasted garlic is so delicious that I could easily eat every single clove of creamy garlic spread on slice after slice of crostini. I know it sounds crazy, but really, roasted garlic is so mellow, creamy and nutty that it's nothing like raw garlic. Along with the garlic, I roasted some beautiful tomatoes on the vine, a red bell pepper and some onion to add to the soup. My secret ingredient for the soup is a pinch of nutmeg and a few tablespoons of unsweetened cocoa powder - it gives the soup a wonderful richness and amazing flavor. Preheat the oven to 400 F. Line a baking sheet with foil. Place the tomatoes, pepper and onion on the baking sheet. Slice the head of garlic in half, horizontally, to expose all the cloves. Place the two garlic halves on small squares of foil. Drizzle the vegetables and garlic with the oil, then season with salt and pepper. Wrap up the garlic in the foil squares and place on the baking sheet. Roast vegetables for 1 hour. Set aside until cool enough to peel the skins off the tomatoes and pepper, and to scoop the roasted garlic out of the cloves. In a large stockpot, combine the roasted vegetables (including all the garlic - don't be afraid - the roasted garlic is very mellow and won't overpower the soup). Add the beans, in their juices, and the broth. Use an immersion blender to puree until smooth. Add the cumin, chili powder, cayenne, nutmeg and cocoa, and more salt to taste. Bring to a boil over medium-high heat, then reduce to medium-low to simmer for 30 minutes to an hour, until thick and flavorful. Before serving, stir the lime juice into the soup. 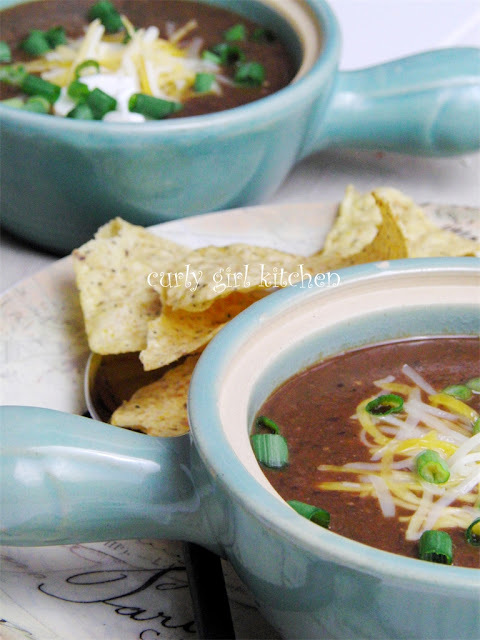 Serve with grated cheddar cheese, non-fat sour cream, sliced green onions and tortilla chips.